The Main show was on everyone's mind from Thursday through its closing on Sunday. The attendance was down a little from last year but there were still large crowds. It sort of makes sense given that last year's theme was the Top Fifty Mineral Localities of the USA and the cases assembled were a once in a lifetime viewing opportunity. The main show is also the best chance for people to visit. It is an interesting sort of experience actually as people, with diverse backgrounds who share a common interest, gather from around the world to talk and gawk at rocks. It is fun to visit with people you haven't seen for six months or even a year and then resume a conversation like it was just yesterday. This is the real value of attending mineral shows - enjoying the community of people who have lost their minds over minerals. The rocks are fun too of course but people are what make a show worth attending. A number of people are also generating online diaries of their visit to Tucson and it is always advised, by me, to read and see as much as you can about a mineral show. Check out prolific photographer Gail Spann's effort here . Here are Gail & Jim Spann with my wife Colleen on Saturday at the Main Show. with some small ammonite fossils. The guy who carved this is a fractal artist in my opinion !! The TGMS club organizes a large banquet for show goers. Here's Jeff Scovil and friends enjoying supper. The silent Auction for Rocks & Minerals and the Mineralogical Record had many people writing their names in on the form up to the last second. This year, as in recent years past, I will be conducting a special auction to benefit the color fund for Rocks & Minerals. Working with Tom Gressman, new assistant editor for the Mineralogical Record, I will be adding specimens for the Min. Rec. also to the same auction which will be available in early April. Only 30 seconds left... SOLD! Moments after the auctions had closed Stretch and Jesse Fisher chatted about a large mine map Stretch had won. Stretch and Lynn were announced as the winners of the prestigious Desautel's Award. Stretch and Lynn in front of their winning case of Pseudomorphs. I have to express my unsolicited two cents worth here and heap some praise on the TGMS award selection committee. There were several cases up for consideration that were competing for the Desautels award and these cases were filled with screamingly gorgeous mineral specimens. The committee kept the show theme in mind - Mineral Oddities - and made the best choice for 2009. The award went to a very mineralogically interesting case that was painstakingly and earnestly assembled over many years one specimen at a time. Stretch has taught himself all he knows about mineralogy and found pseudomorphs to be of keen interest to him. It is gratifying to see the TGMS recognize a mineral case filled with specimens of mineralogical interest instead of the flashy stuff that justifiably seems to win year after year. Big high five Stretch and Lynn! And if this wasn't enough Stretch and Lynn had three other cases - one on Tungstates, one on synthetic minerals and another educational case on pseudomorphs. Their case on synthetic minerals. What's that near the center? Synthetic WULFENITE??? ARE YOU KIDDING ME???? A big long bogus zincite from Poland. Here are three specimens from their Tungstate case. Rhodo on the left, sturmanite on the right "Frankenrhodo" in the center. All kidding aside the Young's case on one mineral replacing another was quite informative. On Sunday Brian Swoboda was seen with Dave Wilber taping content for their Blue Cap production of What's Hot in Tucson 2009. Scott Werschky had this 4.5 cm, odd ball, elongated fluorite crystal from the Erongo Mountains in Namibia. UK Mining Ventures friend Jesse Fisher pointed me towards one of the more off the wall mineral oddity cases - a case on compounds formed in wine barrels during fermentation. I mean they REALLY studied this stuff with an XRay diffraction machine. A case of quartz after halite from the Atlas Mts. of Morocco. There's always someone who takes it a bit further than most... next year's theme ought to be Odd Mineral Collectors. The ever changing face of the blitzed miner. Near the end of the day on Sunday it was Dona Leicht. Turns out that this case was changed frequently by Peter Magaw with faces from many dealers and collectors during the course of the show. perfectly situated baveno twin. This is one of the neatest rocks I saw in Tucson and I almost missed it. Thanks Mike!! That'll wrap it up for another year here in Tucson. I think everyone came here with their expectations somewhere around their ankles in terms of how the market might be. We're probably just at the beginning of a fairly lousy economy that seems like it is still moving south. That was the topic of well over half the conversations I had here in Tucson. Some dealers had great shows but their numbers were dwarfed by those that had mediocre or lousy shows. There seemed to be a consensus that the dealers offering bargains and those that had the best of the best had very good shows while those who offered specimens in the $500 to $10,000 range generally accumulated a bit more dust to clean off when they get back home. It feels like the market is changing and a sign of that might be the Stack's auction that was held on Friday the 13th (no really!!) at the Convention Center. I went there on Thursday with Don Zowader to see what was being offered and I have to be bluntly honest here. The people that put this auction together have brass huevos. Their price estimates, descriptions and pictures in their catalogues were just head scratching. Any benitoite offering is always going to be of interest to me and so I went to see them first. Price estimate for one of the benitoite specimens was $35,000-$40,000. Huh? What I saw were several light to moderately crossite included crystals of benitoite to about 3.5 to 4 cm cm on a specimen about 12 cm across. The picture in the catalogue showed rich vibrant blue crystals which were in fact dull grayish blue. The thing is worth maybe $750-$1000 due to the size of the crystals and the fact that some are or were not included that much. There is damage all over this thing which the description fails to mention. The starting bid for this thing was $26,000 !! Are you kidding me??? That is just off the wall nuts! I am happy to report that this one had no takers. In fact 90% of the specimens offered were not bid on I was told and as their archive of the auction indicates. I had an interesting conversation with another dealer who was viewing the specimens at the same time I was on Thursday and he pointed out that Stack's is a Coin Auction dealership and they specialize in coins. He said some of the bidders in the coin world think nothing of dropping $500,000 or more on a rare quarter and if they think that they can get a specimen, touted as one of the best of California's state gemstone, for under $50,000 then it is probably a great deal. He said it was not important that they understand minerals or mineralogy only that we start attracting more people like that to the hobby. So, if we are striving to bring what I would term "stupid money" into the hobby and relying on them to sustain asinine prices for mediocre specimens it seems like we are constructing a house of cards. I can't fault the dealer I spoke with for his logic. From an economic perspective it makes perfect sense. I just feel like we, as a dealer community, are not doing what we need to to bring education to the forefront of the hobby so that the collector gains a better understanding of what minerals are and why collecting them can be rewarding for other than monetary purposes. The world is filled with very wealthy people who are immune to what most of us are going through in this current economy. Many, but by no means all, are happy to drop large sums on minerals and collect them as "natural art". They don't really care to know what the mineral is made of or any of the relevant science about their specimens. They just need to look pretty. Fair enough. Conversely, there are also many knowledgeable and savvy collectors who know the real value of scarce minerals and they too will fork over large sums for important specimens. Their involvement helps to find the true value of the high end market I think. To my mind, though, it is risky to create a market that is unsustainable and reliant on people to keep paying more and more for mediocre minerals. Just ask real estate dealers in Florida, California and Arizona about housing bubbles. Or for that matter the rare coin business which collapsed under a bubble in the early 1980s when prices shot up with gravity defying speed. I don't know everything and I will be the first to admit that but this Stack's auction just wreaked of carelessness with the embellished photos, flowery specimen descriptions and Monopoly (the game) money pricing estimates. I should point out that these comments are mine and mine only. The TGMS is in no way responsible. They are merely the observations of a casual observer. Ok, so while this high end thing gets sorted out there were still beaucoup chances to find minerals of interest and value here in Tucson. Tucson is still the king when it comes to attracting minerals from around the world and there is no where I would rather be during winter than here. There were some new things I missed or was late on and the most important of these are the new floater cuprite crystals from a locality in Russia. I am sorry that I have no more information on them than that but I am certain they will be talked about on the Mineralogical Record's website soon. 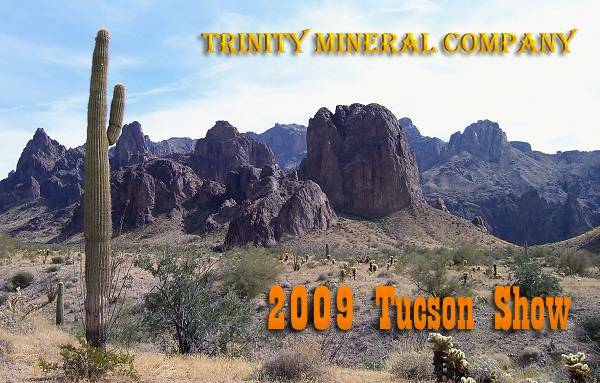 The Tucson Gem & Mineral Society is to be commended for their enduring commitment to our hobby and their copious volunteer efforts to bring this large diverse group of people to the same place each year. This was the 55th anniversary of the Tucson Gem & Mineral Show. I am certain that I will be at all the rest of them until that inevitable day comes. I will be back in Tucson in 2010 to do it again.